Call or Email or Text Us today and let’s build your backyard paradise together! Please be advised; selection is a preferred week of service based on the chosen day. A technician will contact you shortly to schedule your day of service. When using Sweeney’s Pool Service Inc. you can be rest assured that a licensed professional will be servicing your pool. This is so important because it verifies that our technicians are trained the correct way and can handle any situation that comes up. Some pool closings are very basic (one pump, one filter), however many pools consist of multiple pumps, filters, heaters, waterfalls, salt water systems, laminar effects, sheer descents, slides, UV systems, automated systems, etc. We understand the value of your equipment and know how to properly handle it. Proper winterization of your swimming pool is crucial considering the long winter months are harsh and can cause expensive damage. This is why we use commercial blowers to blow out the plumbing lines to ensure your investment is protected. Our work vehicles are equipped with state of the art equipment so that each job can be handled correctly. All handrails, diving boards, & ladders are taken out and stored in shed or garage (customer’s preference). Filter site is taken apart, pumps are drained, filters are drained and cleaned, any accessories (salt system, chlorinators, & electrical components) are disconnected and stored away. Heaters are properly winterized and drain plugs are pulled to ensure the last bit of water is drained. All plumbing lines are blown out with a commercial machine. All pool orifices are plugged once the plumbing lines are blown out. Skimmers get gizzmos (winterization devices) to prevent any cracking of the housing. 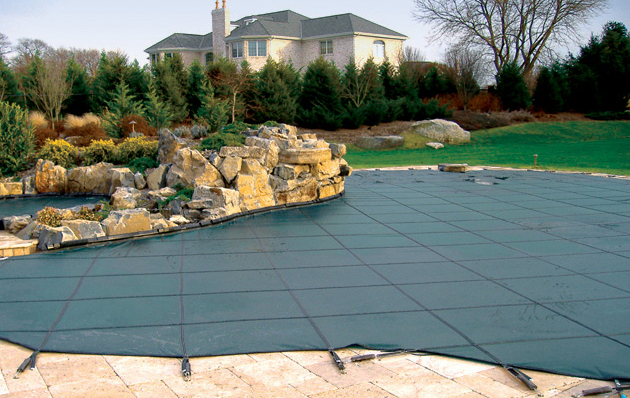 Liquid chlorine & a winterizing algaecide is added prior to cover installation to prevent excessive algae growth. Once job is completed, the lead mechanic will leave a fully detailed invoice with the customer & answer any questions.